ShoutPM are a leading promotional merchandise provider in the UK, working closely with large corporate companies such as Bing and Microsoft. Since the success of their first SEO project in 2012, ShoutPM have already invested in another website to target other areas within their industry. Fully included within our Page 1 guarantee, we're on target to reach all goals by fall of 2013. 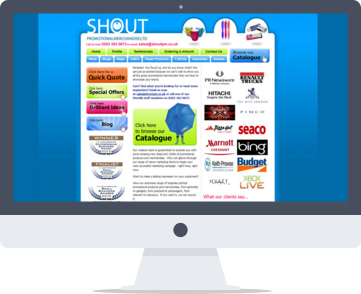 ShoutPM are a leading promotional merchandise provider in the UK, working closely with large corporate companies such as Bing and Microsoft. Their existing website gave no flexibility so they could not make any changes without the help of a web designer. Therefore they needed a CMS system developed so they could then make changes to their website on a daily basis. Using their existing website as a framework we developed a custom built CMS system which now means they can make these changes whenever required. Once completed we then launched an ongoing SEO and AdWords campaign aimed at dramatically increasing web traffic and online enquiries.